No matter what game you are in, measuring efforts in a particular time frame is vital to delivering a successful outcome. Runs, hits and errors are measured each inning on the diamond. Yards, sacks and turnovers are totaled each quarter on the gridiron. Rebounds, points and assists are tracked each period on the court. In the Admissions game, weekly milestones are marked with inquiries, applications and admits. So how is the game going for you? Assuming you started rolling admissions September 1, you are approaching the end of the first quarter. Where are those inquiries, campus visits and applications in reaching your first-year enrollment goals? What percentage of those needed by the start of the Fall 2010 classes do you have now? Many experts in the admission’s field estimate that by Week 14 (roughly December 1) you should have received 81% of your total inquiries, documented 49% of your campus visits and 35% of your application pool should be completed. Is your admissions team on a winning streak or is there a clubhouse wide slump occurring? How many students will be left on base? How many students will get intercepted? How many students will there be on campus for the tip-off? If you aren’t tracking where you know you should be ask yourself this: is it a coaching problem or a technique issue? Staff training might be an answer. It has been for college admission offices across the country who have implemented programs such as the Interactive Training Workshop that Longmire and Company offers. Or, perhaps a better scouting report on your prospects is the key. Literally hundreds of thousands of students have told us that it was the school that best “understood” them as an individual that topped their list. Read here http://thechoice.blogs.nytimes.com/2009/11/03/02momu/ about one young person’s “Aha moment” while visiting a campus and imagine how powerful it would be to know this in advance of your recruitment discussion with her. Longmire and Company’s Yield Enhancement Survey (YES) provides inside information on your prospects. With the right tools, admissions teams are now realizing a home field advantage throughout the season and well into the playoffs. 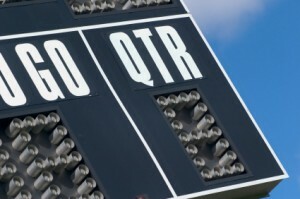 If your weekly box score is not where it should be let Longmire and Company enrollment solutions (www.longmire-co.com) team with you to bring more victories to your win column before the 7th inning stretch, the two minute warning and the 24 second clock expires. Mark Thompson is an Enrollment Strategist with Longmire and Company. Mark brings his clients the benefit of over 20 years of “in-the-trenches” experience in enrollment with public, private and proprietary colleges and universities.